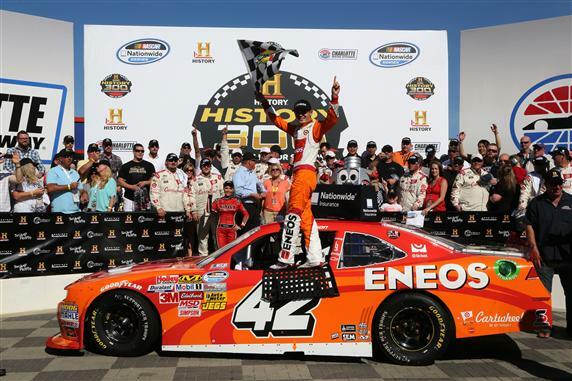 CONCORD, N.C.—Once Kyle Larson made a breathtaking pass for the lead just past the midpoint of Saturday’s History 300 NASCAR Nationwide Series race at Charlotte Motor Speedway, the outome was all but decided. Larson led the last 56 laps and 82 of the last 83 to win for the first time at Charlotte, the second time this season and the second time in 43 starts in the series. Larson passed Brad Keselowski in traffic on Lap 118 of 200 and stayed out front the rest of the way, save for one circuit during a cycle of green-flag pit stops that ran from Lap 140 through Lap 144. Ultimately, Keselowski finished second after a heated late-race battle against polesitter Kyle Busch for that position. “It was about perfect for us,” Larson said of his afternoon at the track. “It was nice looking in the rear-view mirror and seeing them get smaller and smaller each lap. It’s not very often that you see the 22 (Keselowski) and the 54 (Busch) get smaller in your mirror. Busch held third, followed by Kevin Harvick and Brian Scott. Matt Kenseth, Regan Smith, Trevor Bayne, Chris Buescher and Ty Dillon completed the top 10. With Chase Elliott running over debris and hitting the wall on Lap 87, leading to a 37th-place result, Smith took over the series lead by five points over Elliott Sadler, who came home 12th, the last driver on the lead lap. Elliott dropped to third in the standings, 28 points behind his JR Motorsports teammate. Busch fought a loose handling condition for most of the race and summed up his run succinctly. In heavy traffic, Larson whipped past Keselowski on Lap 118, holding his No. 42 Chevrolet wide open in spectacular fashion through Turns 3 and 4 as Keselowski’s Ford was blocked by lapped cars in the lower lanes. “I thought, if I could catch Brad in a bad spot in traffic, I could use it (the high line) to my advantage, and that’s kind of what happened,” Larson said. “I saw a lot of lapped traffic ahead of us, and he had yet to try the top, or as high as I was going. With Keselowski saving fuel during the latter stages of the long green-flag run, Larson opened an advantage of nearly four seconds, but Keselowski whittled three seconds off the margin by pitting under green on Lap 141, two laps earlier than Larson. On fresh tires, Larson stretched his lead back to more than two seconds before NASCAR called a caution on Lap 169 for debris in Turn 3. All lead-lap cars came to pit road for four tires on Lap 171, with Larson retaining the top spot, trailed by Harvick (who gained one position), Keselowski and Busch (who picked up two spots on the exchange of pit stops). From the restart on Lap 175, Larson pulled away to win by 1.480 seconds over Keselowski. 1. (3) Kyle Larson(i), Chevrolet, 200, $58525. 2. (2) Brad Keselowski(i), Ford, 200, $44300. 3. (1) Kyle Busch(i), Toyota, 200, $41000. 4. (5) Kevin Harvick(i), Chevrolet, 200, $26550. 5. (6) Brian Scott, Chevrolet, 200, $29000. 6. (7) Matt Kenseth(i), Toyota, 200, $19775. 7. (8) Regan Smith, Chevrolet, 200, $25050. 8. (16) Trevor Bayne, Ford, 200, $23100. 9. (13) Chris Buescher #, Ford, 200, $23300. 10. (11) Ty Dillon #, Chevrolet, 200, $22825. 11. (15) James Buescher, Toyota, 200, $21000. 12. (10) Elliott Sadler, Toyota, 200, $20475. 13. (4) Dylan Kwasniewski #, Chevrolet, 199, $19975. 14. (23) Ryan Reed #, Ford, 199, $19400. 15. (12) Jeb Burton(i), Ford, 198, $19680. 16. (24) Johnny Sauter(i), Toyota, 198, $13000. 17. (20) Brendan Gaughan, Chevrolet, 198, $18575. 18. (19) Ross Chastain(i), Chevrolet, 197, $18350. 19. (27) Dakoda Armstrong #, Ford, 197, $18275. 20. (18) Mike Bliss, Toyota, 197, $18825. 21. (21) JJ Yeley, Dodge, 197, $18075. 22. (26) John Wes Townley(i), Toyota, 197, $12020. 23. (31) Jeremy Clements, Chevrolet, 197, $17970. 24. (22) David Starr, Toyota, 197, $17905. 25. (29) Jeffrey Earnhardt, Chevrolet, 196, $18370. 26. (17) Chad Boat #, Chevrolet, 196, $17835. 27. (28) Ryan Sieg #, Chevrolet, 196, $17800. 28. (25) Josh Wise(i), Chevrolet, 195, $17765. 29. (34) Eric McClure, Toyota, 194, $17720. 30. (14) Landon Cassill, Chevrolet, 193, $17975. 31. (32) Tommy Joe Martins #, Dodge, 191, $17640. 32. (30) Kyle Fowler, Chevrolet, 191, $11595. 33. (33) Carlos Contreras, Chevrolet, 191, $17550. 34. (38) Joey Gase, Toyota, 189, $17520. 35. (39) Chris Cockrum(i), Chevrolet, 186, $17485. 36. (36) Derrike Cope, Chevrolet, 184, $16600. 37. (9) Chase Elliott #, Chevrolet, 174, $16600. 38. (37) Harrison Rhodes, Dodge, Engine, 135, $16556. 39. (35) Kevin Lepage, Dodge, Rear Gear, 95, $10435. 40. (40) Tanner Berryhill #, Dodge, Engine, 81, $10330. Average Speed of Race Winner: 149.771 mph. Time of Race: 02 Hrs, 00 Mins, 11 Secs. Margin of Victory: 1.480 Seconds. Lap Leaders: K. Busch(i) 1-25; J. Clements 26; K. Busch(i) 27-28; M. Kenseth(i) 29-83; B. Keselowski(i) 84; M. Kenseth(i) 85-96; B. Keselowski(i) 97-117; K. Larson(i) 118-143; J. Buescher 144; K. Larson(i) 145-200. Leaders Summary (Driver, Times Lead, Laps Led): K. Larson(i) 2 times for 82 laps; M. Kenseth(i) 2 times for 67 laps; K. Busch(i) 2 times for 27 laps; B. Keselowski(i) 2 times for 22 laps; J. Clements 1 time for 1 lap; J. Buescher 1 time for 1 lap. Top 10 in Points: R. Smith – 414; E. Sadler – 409; C. Elliott # – 386; T. Bayne – 379; T. Dillon # – 378; B. Scott – 354; B. Gaughan – 309; J. Buescher – 303; C. Buescher # – 295; D. Kwasniewski # – 285.